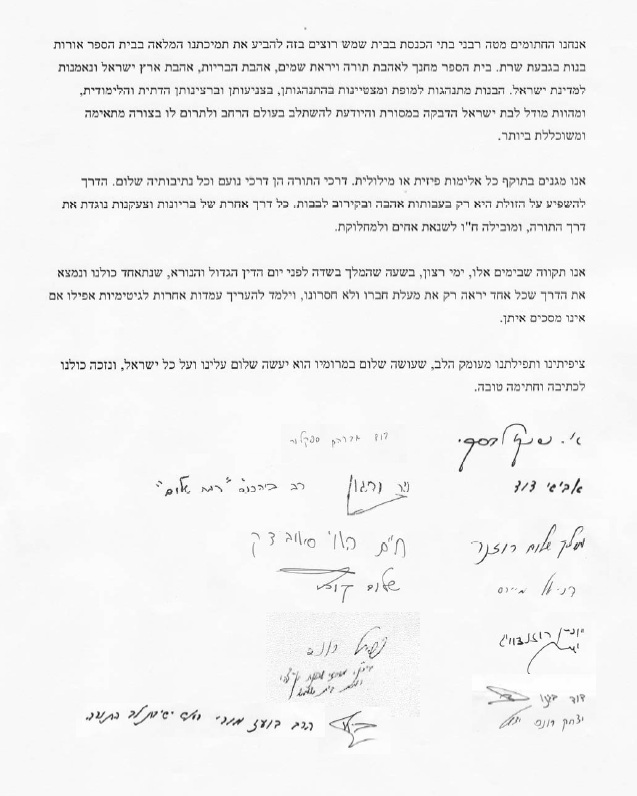 The letter is signed by the following community rabbis: Rav David Spector, Rav Avishai David, Rav Sheinkolovski, Rav Kurtz, Rav Rosenzweig, Rav Shalom Rosner, Rav Yitzchak Rones, Rav Vargon, Rav Menachem Cooperman, Rav Naftoli Rones, Rav Boaz Mori, Rav Bagno, Rav Chaim Soloveichik, and Rav Danny Myers. I think that all of them also attended the rallies in support of Orot. Most of these rabbanim are Dati-leumi (national religious). Some are borderline/ moderate charedi. None of the numerous more charedi rabbanim in the city are signed on it; I don't know how many were approached, but I know that at least some were approached and refused to sign. Finally, I recommend that everyone read this fantastic statement by Rabbi Shaul Robinson. And there's a fascinating article in the often abominable secular-left Ha'aretz which is thoughtful and balanced. For a different perspective, I suggest reading this opinion piece. Since the Charedim seem to want to act like their Muslim co-coreligionists, maybe appropriate response is to learn from that community. 2a: to test the truth, validity, or genuineness of, "the exception proves the rule", "prove a will at probate"
What about Rabbi Lipman who was in the original videos posted on this blog a few months back. He's a charedi from Ner Yisrael isn't he? Not in any relevant sense of the term. Sorry for a tangent: What does Dudi Bagno do? >"Here is a letter [which] notes that the girls are both religious and dress modestly according to halacha"
And what if they were not religious, or did not dress according to halacha? That is a good point, especially since the extremists "probably" don't rely on the signatories to this letter as their halachic authorities. There has to be a greater emphasis on the fact that, even if one has genuine grievances (which they apparently feel that they do), it is still required to behave like a human being. The Ha'aretz article is fascinating. If a Toldos Aharon grandee like Shmuel Pappenheim is talking about openness, change in the charedi community must really be on the way. If that is correct, the current fracas in Bet Shemesh is the last gasp of the extremists. IMHO change is coming because economic factors will force it. The only question that needs to be answered is the proverbial do you want to do it the hard way or the easy way. So far the answer seems to be the hard way. Is R' Chaim Soloveitchik, R' Aharon's son, formerly of Chicago? Is this a national scandal too? Or does only the Israeli knesset decide on whether to make this into a national scandal that villifies certain sectors of the public? Again, I am against violence in Bet Shemesh and those perpetrating it. But I want to know why these other events are always ignored, including by the crowd here who is so convinced that defaming all haredim and all religious Jews by the media is ok, as long as it brings more attention to the suffering of the Orot girls (and who mistakenly think that that will actually cause the govt to do something to help those girls, which they obviously won't IMO). HaRav Hayim Soloveichik is HaRav Aharon Soloveichik's son and is indeed from Chicago originally and now heads Mosdot HaRav Aharon Soloveichik in Israel. R' Natan, perhaps you could post this as a guest poster? There has been an uproar in recent weeks about the silence of the Charedi rabbonim in regard to mistreatment of and violence against women and children. Much of the complaining has actually emanated from within the Charedi community itself. Many of the “men (and women) on the street” in the Charedi community are appalled at the behavior of these select few and the reluctance of their own rabbis to condemn these actions. As a resident of Ramat Bet Shemesh, a neighborhood in the thick of the action, I come in defense of the silence of the Rabbonim. I clearly understand from where their reluctance to vocalize their opposition comes. The Torah, when describing the behavior of the brothers of Yosef, teaches a valuable lesson. Sometimes from a negative action we can learn a positive trait about another. The brothers of Yosef are credited to have spoken “of equal heart and mouth”. They didn’t feign an external love for Yosef while harboring hate within. They spoke harshly to him because they felt animosity toward him. So while the Torah doesn’t condone hatred of others It does point out the consistency in their actions. In this light I truly understand (and perhaps even respect in some little way) why the Rabbonim of Ramat Bet Shemesh are silent on the treatment of the Orot students by the “extremists”. How could rabbonim of Ramat Bet Shemesh condemn the lack of respect for women when they themselves attempted to take total control of the mikve less than 2 years ago? Their “grab” at the mikve was in sense saying "we don’t respect your choice of rabbinic supervision and you must follow our way". Could we expect rabbonim to issue a statement about loving all Jews when they themselves exclude certain tzedaka organizations from having a presence (to collect) in their shuls? The same rabbis have no issue with that organization assisting members of their kehilla. And what would we say to a statement about respecting and loving ALL Jewish children from the very rabbis who formulate school policy contracts that forbid their students from interacting with other RELIGIOUS children just because they attend different schools? Would it not be hypocritical to expect a rav to oppose vandalism of a school when these rabbonim are silent on the vandalism of signs and banners of worthy organizations in their community? What shall we say when a rav says “it’s not my job to deal with the extremists…it’s up to the police” when those same rabbonim forbid in no “uncertain terms” going to the police about child abuse. These rabbonim clearly understand that to issue such loud condemnations would violate their standard of being of “one heart and one mouth”. So while I may disagree with their stances on all of the above I must (silently) applaud their remaining consistent even while their own congregants are taking to the streets and the blogs. Could be, but let's try to get confirmation from a more reliable source before we talk about it. This is parody, or a sincere underhanded defense? PARODY for sure...read it carefully. Student V. I am not sure you will be open to an honest discussion about this. But try this on. Do you really think that if the phenomenon of attacking Chareidim becomes a real issue you will not have the Dati Leumi and (some but not all) Hilonim protesting to try and change things? Do you not think that the same Rabbis on this Letter would not issue condemnation and encourage their constituents to stand in solidarity with their fellow Jews? If it was determined that it was something in the education that was causing this, do you not think there would be a movement to reeducate youth to have respect for others who are different than them? You keep repeating the same things - that you are against violence but the police are to blame. You are blind to the possibility (at least publicly) that there is something in the Hareidi attitude that needs addressing. Shifting the issue to Hiloni (or Dati Leumi violence if it C"V comes to it) acts against Hareidim may make you feel better about your position - but I am confident in OUR leaders that their message will be unambiguous and that you will not have to constantly scan the news to find one balanced opinion from the non Hareidi camp. Now can we get back to the issue at hand? In Defense is a great piece..I believe that you should post it. Why am I not open to an honest discussion? Because you don't like what I wrote? I don't understand what you mean about "becoming a real issue." One single incident makes it a real issue. That is certainly the litmus test employed by the media and the new israel fund. But that's besides the point. Why shouldn't we be sensitive to these kind of attacks? I think the very first moment there were men harrassing girls of the orot school it was a scandal and a crime. I didn't need to wait four months later (or however long it was) for the media to convince me it was a problem by blowing it up in the national scene, sending in feminist protestors, and tying it to unrelated issues. Similarly there were several anti haredi atttacks just in the past few days and it certainly seems to be linked to a media villification campaign. If you think the attacks in bet shemesh are linked to a dati leumi villification and chiloni villification campaign within toldos aharon sect (and several others), I would probably agree. You say the real issue is attitudes in haredi world? I say bupkess. Attitudes vary. And even the worst of attitudes do not produce actions like this except for in a tiny minority of a minority. What the real issue is, is that there is a very acute problem, known and experienced for months, w clear perpetrators and victims, and it is allowed to fester when it could be stopped. Why? And you would rather I pontificate about haredi education? The fact that the nationwide media blitz (not to mention incitement on the radio) has led to anti haredi violent attacks is a real issue. One that I was bringing up. It does not make me feel better about "my position" or about anything. Its a terrible tragedy these things are happening to Jews in the Jewish homeland. And you feel better because of some letters that "YOUR" leaders would write? Yes we know that some dati leumi, and as we see now some haredi too, rabbis are very good letter writers. I just don't get it. Are we supposed to feel better about ourselves because "our guys" are writing and saying the right things that make us feel proud? Or are we supposed to feel better that the children are being made safe? I would like to see the women and children protected and wouldn't care if not a single heroic condemnation letter was written if that outcome could happen without it (not that I mind these letters). I hope that rbs residents including Rabbi Slifkin will keep us updated on what is really important - are steps being taken inside rbs to protect women and children from harm more than they were say 2 weeks ago? His proof was from Rav Adda bar Ahava who "observed on the street a woman named Matun (patience) dressed in a manner unbecoming a modest Jewish woman, he violently rebuked her. Unfortunately for him, the woman was a Samaritan, and for the attack on her he was condemned to pay a fine of 400 zuz, and thereupon he repeated a popular saying, "Matun, matun [waiting, patience] is worth 400 zuz!" (Babylonian Talmud Berakhot 20a.) Wikipeida. I struggle with this gemara and how it does seem to bolster the extremists' cause of imposing modesty rules on others. "I struggle with this gemara and how it does seem to bolster the extremists' cause of imposing modesty rules on others." How is it any different than hitting children for education? Ok. I dont want to get into a heated back and forth discussion but I will respond to hopefully clear things up. I think one of the differences between what you and I are saying is that you seem to think there is ONE issue at hand and that is the practical and Maasi safety of those walking to school. I think that is important but that is not the issue R. Slifkin is talking about in these posts. If there was agreement that localized personal safety was the only issue there would be no need for discussion as I think everyone agrees it is important. Likewise you seem to think there is one party to "blame". I think there may be different parties to "blame" or to put it more positively I think there may be many directions to direct effort for change. The issue that is being discussed most on this blog and indeed on several blogs that cover the Dati/Hareidi world is whether there is need for introspective heshbon hanefesh in the Hareidi world and disappointment that it does not seem to have taken place in Israel. You disagree with this need - fine we are in disagreement and I dont think we need to take it much further. As to violence against Hareidim. I don't deny that there is negative feeling towards Hareidim (that may have some basis for justification in Israeli society - as there is the opposite attitude from Hareidim) that causes violence or abuse (that has no justification). And I dont deny that the negative feeling expressed in the press (both justified and not in my opinion) may contribute to the anti-Hareidi attitude. I also would not be too surprised if the anti-Hareidi attitude gets out of hand (C"V - this would be terrible) as these are very emotional issues that have been building and festering for a while. But none of this has happened yet. And there have been opinions expressed by politicians and leaders to keep the debate focused on issues and not get out of control - and these are justified and correct. But so far the pendulum has not yet swung in that direction. So far there are still issues that need to be resolved to bring Israeli society back from extremist kefiyah datit (I know we disagree here so no need to comment). I for one hope that we can move in that direction with violence on both sides kept out of the picture. "Are we supposed to feel better about ourselves because "our guys" are writing and saying the right things that make us feel proud?" Obviously, the social situation was radically different then. "see R' Aharon and R' Meidan on Tag Mechir for true leadership)"
Can you post a link of what you are referring to. Sorry about that reference that was a little cryptic even for me - see http://www.kipa.co.il/now/46250.html for unequivocal condemnation AND a practical call to bring any information to the authorities. Sorry it is in Hebrew. This is an example of the kind of leadership I would hope for when confronted with something shocking from within a Gadol's purported constituency. Not a need to apologize for all Dati Leumi or settlers over the green line or a press conference but an unambiguous moral line in the sand as well as a practical "psak" to do something about it. "IMHO change is coming because economic factors will force it." Not as long as the government subsidies continue to flow. I always assumed that the Gemara in Berachot 20a is referring to a situation where the religious authorities were responsible for the conduct of the members of their community. In other words, Rav Adda Bar Ahava represented a valid communal authority, with uncontested right to dictate standards of behavior within that community. Anyone outside the bounds of the valid communal authority was outside his jurisdiction. Accordingly, when Rav Adda Bar Ahava did something outside the bounds of his authority, he was fined (and didn't have any complaint about the fine being unfair - he obviously accepted it, as seen in his comment to Matun). The rabbonim, whether they like it or not, have no communal authority, and therefore cannot force standards on those outside their jurisdiction. Dudi Bagno is now the Rav of the Dati Leumi Shul in Ramat Shilo. "But I want to know why these other events are always ignored..."
The event which you are referring to was just featured on TV on Channel 10 news. It included an interview of the girl who was attached. Perhaps Rav Shapira supports the goals of this letter, but wouldn't sign such an overtly Zionist letter. @Higgs Boson - Good to hear that it was covered. @Aharon Haber - I disagree strongly with Rabbi Aharon and Rabbi Meidan. The information that I think should be reported on is when soldiers are coming to destroy and where, and this should be spread around to all the local residents. Oh, but when people try to alert their neighbors, they are arrested for "espionage" - see A7 for the latest outrage of injustice against settlers. Look, if Tag Mechir really exists, it certainly doesn't listen to or follow Rabbi Meidan. But this is actually a good side point related to what I'm about to say to sum up my feelings on the issue and state them clearly to you so you know where I'm coming from. For a long time, the national religious public has looked to the regime and "powers that be" for validation of its existence, and as such it has refused to recognize an enemy that openly declares and conducts war on it, because it is desperate for love and approval from that entity. That other entity defines it, so how can they clash with the regime or the elites of society? It simply "cannot be" that the govt has changed its mores and is now discarding a once useful tool to them. And the establishment leadership such as certain rabbis and yesha council people who are from the old school, who witnessed firsthand IDF heroism, allegiance once rewarded by the govt, in the pre-Oslo era, are shocked and dismayed at anyone who should suggest otherwise. So to the generation that has grown up knowing only Oslo suicide and terror, settlement destruction, and persecution of rightwingers, they overflow with condemnation and exhortations that how dare we oppose our beloved father-figure govt or do anything but accept wholeheartedly no matter what they do. So now I see that police allowed a problem to fester on and on, and oh how convenient, the govt pounced on the opportunity to gain from it politically in a national scandal they helped manufacture. Call me a conspiracy theorist, but to me that just smacks of way too convenient, and sounds just like business as usual for this govt in the fact that it craves the suffering of the national religious who threaten the established oligarchy with their "foreign" values, and how the police has become so politicized especially in settlements. So, were the Orot girls the "sacrifice on the altar" of govt opportunism? (That's a play on Rabin's famous "sacrifices on the altar of peace" line). I wouldn't doubt that for a second. But no one seems to ask that question (Oh, the horror!). All the focus is on haredim. And rather than find fault with the local authorities and the highly politicized police force or a totally perverted so-called justice system, we are awfully quick to pick fault with haredim and their education and attitudes. Granted, there are problems there, and certain pernicious forces at play in those sects which set haredim against religious zionists, I get all that. I just want some focus to also be on the "problem that we dare not mention is a problem," but which should be the most obvious target. Aside from that I do also think the coordinated govt-media campaign of defamation on haredim in response to these events was very evil and causes problems. So I tried to raise that too. But I think you agree with some aspect of that point. I don't mean to excuse the silence of the Hareidi rabbis of Bet Shemesh, but the posted letter was not an appropriate vehicle to elicit their support. It contains the ideological program of religious zionists. As if to say, how dare these hooligans attack one of our schools. The issue was not what the girls are taught or even how they dress. Rather, the issue is the terrorization of young school girls by Hoodlums who really don't care about the school's curriculum. It's simply a power play with the girls as convenient targets.